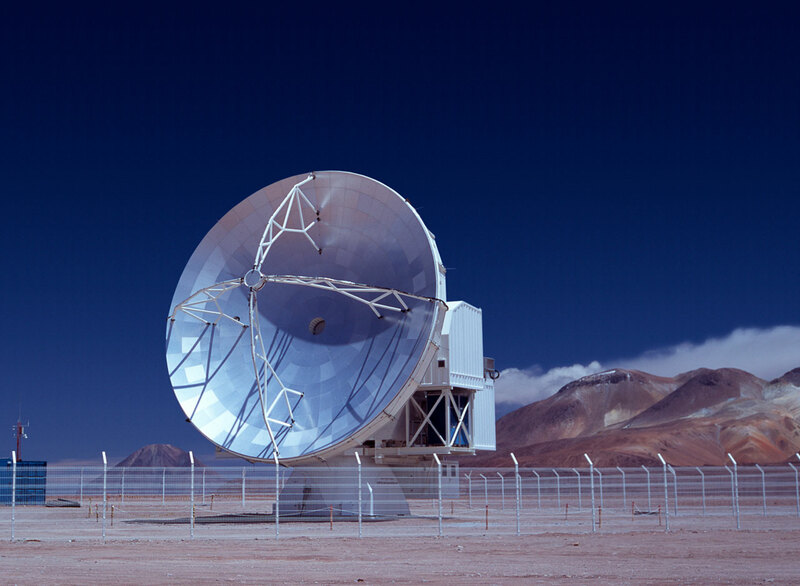 The Atacama Pathfinder Experiment (APEX) project has just passed another major milestone by successfully commissioning its new technology 12-m telescope, located on the 5100m high Chajnantor plateau in the Atacama Desert (Chile). The APEX telescope, designed to work at sub-millimetre wavelengths, in the 0.2 to 1.5 mm range, has just performed its first scientific observations. This new front-line facility will provide access to the "Cold Universe" with unprecedented sensitivity and image quality. Karl Menten, Director of the group for Millimeter and Sub-Millimeter Astronomy at the Max-Planck-Institute for Radio Astronomy (MPIfR) and Principal Investigator of the APEX project is excited: " Among the first observations, we have obtained wonderful spectra, which took only minutes to take but offer a fascinating view of the highly complex organic chemistry in star-forming regions. In addition, we have also obtained exquisite images from the Magellanic Clouds and observed molecules in the active nuclei of several external galaxies. Traditionally, telescopes turn to weak extragalactic sources only after they are well in operation. With APEX, we could pick them amongst our first targets!" Because sub-millimetre radiation from space is heavily absorbed by water vapour in the Earth's atmosphere, APEX is located at an altitude of 5100 metres in the high Chilean Atacama desert on the Chajnantor plains, 50 km east of San Pedro de Atacama in northern Chile. The Atacama desert is one of the driest places on Earth, thus providing unsurpassed observing opportunities - at the costs of the demanding logistics required to operate a frontier science observatory at this remote place. Along with the Japanese 10-m ASTE telescope, which is operating at a neighbouring, lower altitude location, APEX is the first and largest sub-millimetre facility under southern skies. With its precise antenna and large collecting area, it will provide, at this exceptional location, unprecedented access to a whole new domain in astronomical observations. Indeed, millimetre and sub-millimetre astronomy opens exciting new possibilities in the study of the first galaxies to have formed in the Universe and of the formation processes of stars and planets. APEX will, among other things, allow astronomers to study the chemistry and physical conditions of molecular clouds, that is, dense regions of gas and dust in which new stars are forming. APEX follows in the footsteps of the 15m Swedish-ESO Submillimetre Telescope (SEST) which was operated at ESO La Silla from 1987 until 2003 in a collaboration between ESO and the Onsala Space Observatory. SEST operated in the wavelength range from 0.8 to 3 mm. Says Catherine Cesarsky, ESO's Director General: "SEST was for a long time the only instrument of its kind in the southern hemisphere. With it, ESO and our collaborators have gained valuable operational experience with regard to ground-based observations in the non-optical spectral domain. With APEX, we offer the ESO community a most exciting new facility that will pave the way for ALMA." As its name implies, APEX is the pathfinder to the ALMA project. It is indeed a modified ALMA prototype antenna and is located at the future site of the ALMA observatory. ALMA is planned to consist of a giant array of 12-m antennas separated by baselines of up to 14 km and is expected to start operation by the end of the decade. It will bring to sub-millimetre astronomy the aperture synthesis techniques of radio astronomy, enabling precision imaging to be done on sub-arcsecond angular scales, and will so nicely complement the ESO VLT/VLTI observatory. In order to operate at the shorter sub-millimetre wavelengths, APEX presents a surface of exceedingly high quality: after a series of high precision adjustments, the APEX project team was able to adjust the surface of the mirror with remarkable precision: over the 12m diameter of the antenna, the deviation from the perfect parabola is now less than 17 thousandths of a millimetre. This is smaller than one fifth of the average thickness of a human hair! "From the engineering point of view, APEX is already a big success and its performance surpasses our expectations", says APEX Project Manager Rolf Güsten. "This could only be achieved thanks to the highly committed teams from the constructor, from the MPIfR and from the APEX project whose endless hours of work, often at high altitudes, made this project become reality." In parallel to the construction and commissioning of the APEX telescope, a demanding cutting-edge technology program has been launched to provide the best possible detectors for this outstanding facility. For its first observations, APEX was equipped with state-of-the-art sub-millimetre spectrometers developed by MPIfR's Division for Sub-Millimetre Technology and, more recently, with the first facility receiver built at Chalmers University (OSO). APEX is a collaboration between the Max-Planck-Institute for Radio Astronomy (MPIfR), Onsala Space Observatory (OSO), and the European Organisation for Astronomical Research in the Southern Hemisphere (ESO). The telescope was designed and constructed by VERTEX Antennentechnik GmbH (Germany), under contract by MPIfR, and is based on a prototype antenna constructed for the ALMA project. Operation of APEX in Chajnantor is entrusted to ESO. Background information on sub-millimetre astronomy and on the first APEX results can be found as PDF files on the APEX Fact Sheets page. A press release in German was also issued by the Max-Planck Society.